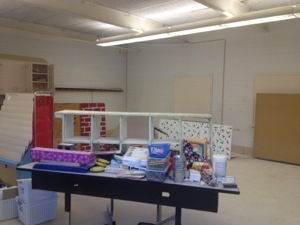 My Magical Classroom in Photo’s! 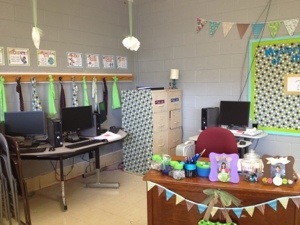 When I walk into my classroom, I feel like I am in a fairy tale! I love reading, books and fairy tales and I want my own children and students to love reading as well. Surrounding them with stories and reminders to read is my tactic- haha! 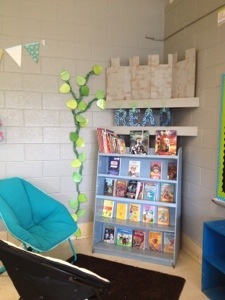 Shown in the picture above is my reading corner. I found those cute and comfy chairs, both from Target – for under $30! The letters that say READ are chipboard letters that are covered in rhinestones. My daughter and I had fun creating them! The little brown rug is a gem that I found at Ross for $11. I love great deals! The castle turret on top of the book shelf is a simple box that I cut and sponge painted with 44 cent gray acrylic paint. 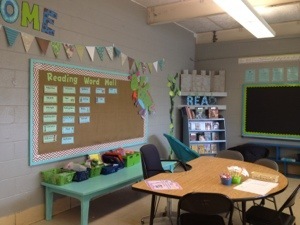 Small Group Learning Area – This is where I do most of my teaching. The blue table behind the semi-circle table, holds all of my supplies for the day and week. Prior to school starting, the table was black and white polka-dotted. It was screaming to be painted! 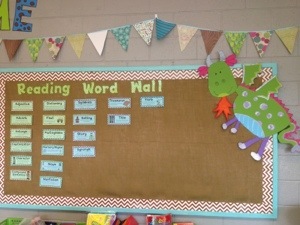 The bulletin board is covered in simple burlap and is the Reading Word Wall. I add “words/skills” as we cover them. This Dragon is “Hot for Learning!” – I actually drew this little guy out from a paper box and then painted him with 44 cent acrylic paint from Wal-Mart. The pennant banner is simple scrap book paper, from Wal-Mart and is stapled to thin satin ribbon. I found the “Reading Word Wall” caption letters at Michael’s! 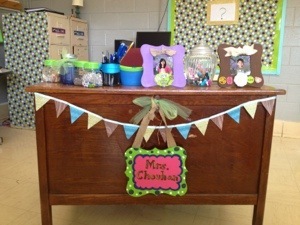 My Teacher Pad – I made a min-pennant banner with the same scrapbook paper. 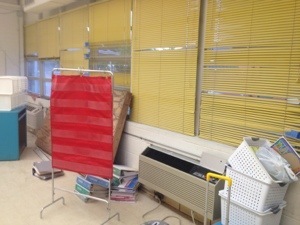 Actually, these are the same pennant banners that I used in my classroom last year. Last year, I used the same color scheme. I made my name sign with a chip board sign and acrylic paint. The frames on my desk are from Micheal’s and were just $1. I was too worn out to paint my filing cabinets, so I just hot-glued my left over material to the side of one! It is the same material that I used for the bulletin board behind my desk. 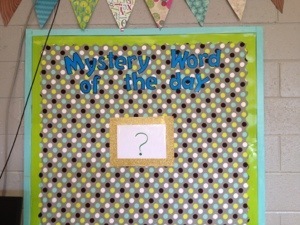 “The Mystery Word of the Day” – I place the definition of a word on this bulletin board and the students have to use their resources (ask an adult, use the internet or a dictionary) to find the correct vocabulary word. Anyone with the correct answer earns $5 in classroom cash!This lovely material is from Hobby Lobby. Computer Corner – So, the backpack hooks are above the computers. I didn’t want to rearrange the furniture, so I added extra material to jazz up the wall above the computers. I’m still not loving it 100%, but it will do for now! 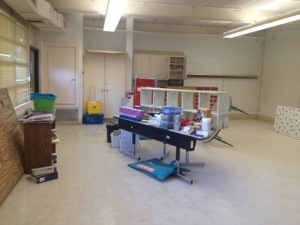 Entrance Area – This is not very fancy, yet! The door to enter my classroom is to the left of my schedule. 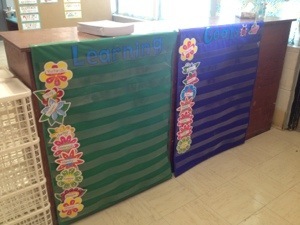 Learning Goals Chart – Each flower has a students’ name on it, and (now) I have target skills beside the names. Math Corner – I made these with “No Sew Glue” from Wal-Mart. It was fun! 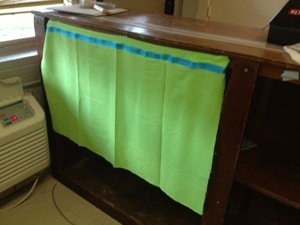 The table below is covered with a lime green table cloth from Dollar General and the room divider contains the Math Word Wall. 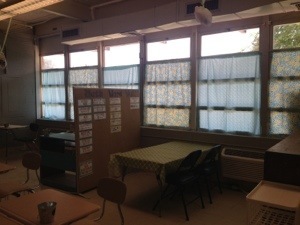 This is a quiet area where children work in partners. 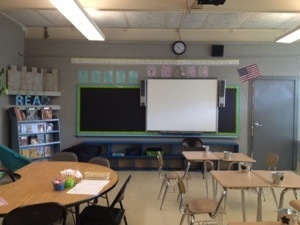 Front and Center – This chalkboard was formerly green and dull. I painted it with chalkboard paint from Ace Hardware (which was half the price of Michael’s). 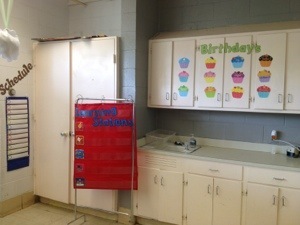 Below the Smart Board is a shelf that contains Language and Math materials. I changed the desk arrangement from what is displayed in the picture. 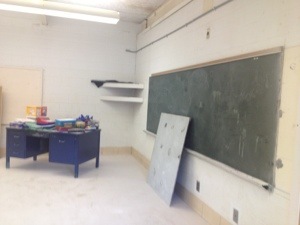 The desks are now back to pack so that the students are not facing each other. 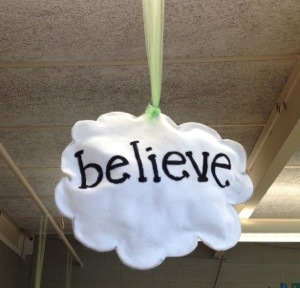 Clouds of Inspiration – I absolutely cannot make those cute tissue paper flowers that hang from classroom ceilings. So, I used white felt, hot glued 2 pieces together and stuffed them with whatever I had lying around (paper towels, scrap felt, etc…). I painted the letters with acrylic paint after I wrote it with a sharpie first. I hung 5 cloud from the light fixtures, using see through ribbon. 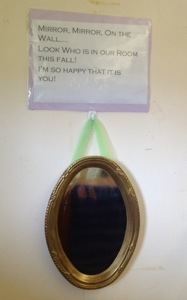 Mirror, Mirror – I have this hanging for all to read, upon entering the classroom. I made it with a silver colored tray from Dollar Tree. I painted gold acrylic paint around the edges (about 3 coats). Curtains, Again! – I used these in my classroom last year. I created them by stapling the green material down at the top and then hot gluing blue ribbon over the staples.